This book covers a wide range of topics, including anarchistic elements in traditional African societies, African communalism, Africa's economic and political development, the lingering social, political and economic effects of colonialism, the development of "African socialism" and its failure, and a possible means of resolving Africa's ongoing crises. The Workers Solidarity Alliance (WSA) was very, very active on behalf of the Awareness League. Most of the campaigns on their behalf we initiated by us. A comrade travelling to Nigeria has met with one of the authors. we are waiting for a full report. military regime, with folks joining their rolls based on this work. Some of the AL participants are still active in civil and social movement stuff. Mainly campaiging against corruption and some other stuff. I am glad an effort was made to track down and speak with some of their former members. One can only hope that in the years ahead, our perspectives will find some stability and long term growth on the African continent. La lutta continua....the struggle continues! Would be really interested to read that when it comes out. 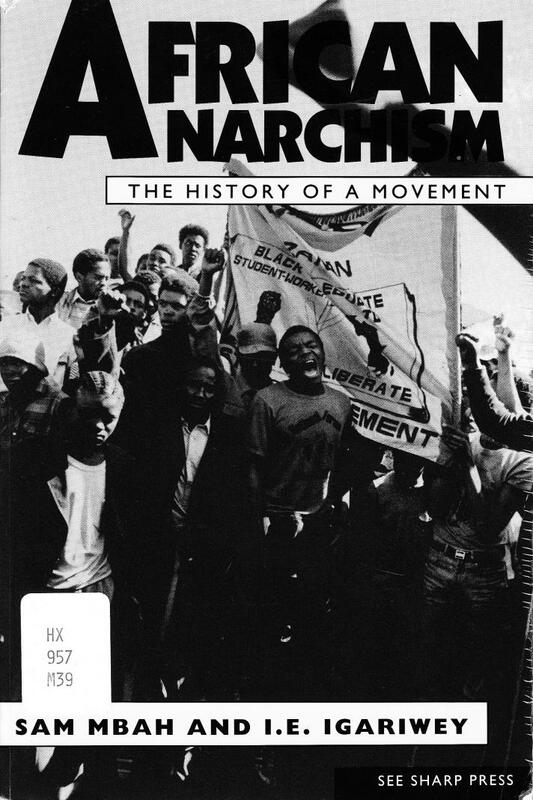 Incidentally, Zabalaza Books has a section on African Anarchism, including links to a lot of articles, pamphlets, historical pieces, etc. One - African Socialism - is by the same authors as this piece. The 2012 interview with Sam Mbah can be found on his new blog: sammbah.wordpress.com. Sam discusses african anarchism, the Awareness League, the capitalist crisis and the fuel-tax uprising, unions in Nigeria and more. The interview is available as a series of short articles and as one long transcript. It is also available in audio form. There are also two separate short videos, recorded with Sam at the same time. have asked the question already in another thread but probably someone here knows more: I remember from old Amnesty reports (either late 70ies or early 80ies) that the Kerekou regime violently cracked down on independent trade unions in Benin (up to 1975 Dahomey), according to the AI reports, they were labelled anarcho-syndicalist or syndicalist. Does anyone know more about this, was this label only a slur by a regime which verbally subscribed to ML ideologies or were there real syndicalist tendencies? I withdrew my cyncial and snarky comment. Was looking over some of my African anarchist notes. For some reason I have a copy of the final page of the "African Anarchism" book in a folder with no notations. I guess I'm moved by the positive sense and attitude of the books authors. "The process of anarchist transformation in Africa might prove comparatively easy, given that Africa lacks a strong capitalist founda- tion, well-developed class formations and relations of production, and a stable, entrenched state system. \V'hat is required for now is a long- term program ofclass consciousness building, relevanteducation, and increased individual participation in social stntggles. Meanwhile, the crises and mutations in capitalism, marxist socialism, and the state system, individually and collectively, cannot but accelerate. For Africa in particular, long-term development is possible only if there is a radical hreak \Vi.th both capitalism and the state system-the principal instrmnents of our arrested development and stagnation. Anarchism is Africa's way out. " The recently deceased Bob McGlynn was an all out, never ending and early supporter of the Nigerian comrades. First when they were known as "The Ax", then as the Awareness League. With NENW and Bob's efforts, we were able to get some tremendous campaigns together on behalf of the comrades in Nigeria. "This work would not have been possible but for the encouragement, solidarity, support and assistance — material and moral — .... Bob McGlynn of Neither East Nor West (USA)"